Orange County’s leadership joined Orange County Convention Center (OCCC) staff members and sustainability industry leaders to celebrate the completion of the Center-to-Table Gardens at the OCCC on November 10. Located inside the OCCC’s Westwood Lobby, the 2,000-square-foot structure provides the ability to grow vegetables, herbs and flowers on property in an all-natural, chemical-free environment. Plants are able to thrive in this structure without the use of soil, allowing a beautiful display of the gardens for guests to see and staff to easily manage without leaving the building. 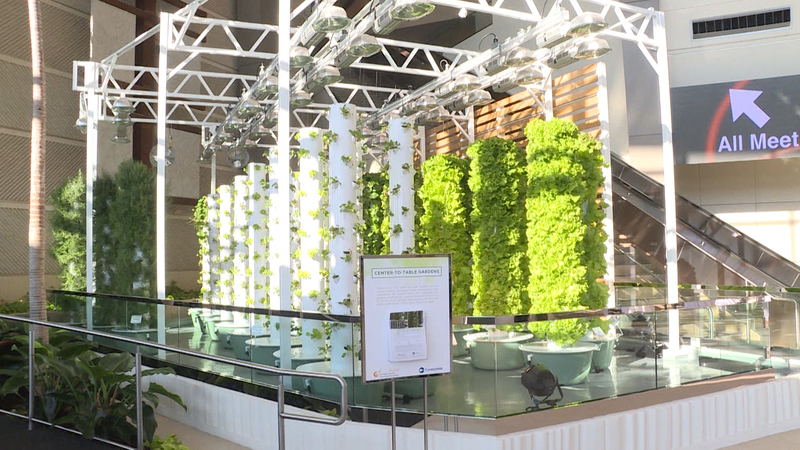 There are 81 plant towers that feature 44 planting spots and produce herbs and vegetables for meals prepared by Centerplate, OCCC’s exclusive food service partner. Centerplate is also responsible for the plants, seedlings and tower maintenance. Already, Center-to-Table Gardens has completed seven harvests since opening. In the most recent harvest, 783 plants were ready for Centerplate to use as ingredients. The Center-to-Table Gardens grows various types of salad greens, including arugula, bibb lettuce, rainbow chard, encore lettuce mix, mustard greens, basil as well as majestic giants and nasturtiums. The OCCC is the second largest convention facility in the nation, attracting nearly 1.4 million attendees who contribute approximately $2.1 billion to the local economy each year. In addition to being one of Central Florida’s top economic engines, the OCCC is also the largest Leadership in Energy and Environmental Design (LEED) certified convention center in the world.